Sometimes, you really need a kick at your butts to get things going. After their coach Terry Pathmanathan's outburst on Monday, the Young Lions restored some pride after they came from a goal behind to draw level with Woodlands Wellington at the Jalan Besar Stadium. "It was a good game as compared to the last two." 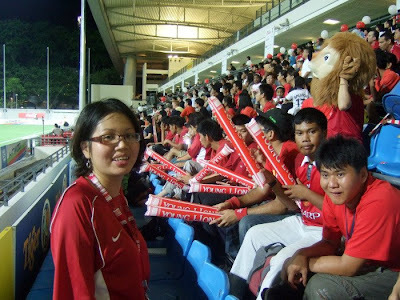 said the former national team skipper (above). "I think one point (from this game) is a consolation for us, though it should have been three points. "We fought and worked hard but have to make some tactical moves to attack as that's the only way (to play) when we are one goal down." added coach Pathmanathan. "My players were under pressure after we lost our last three games." 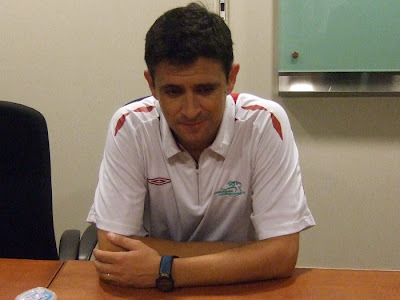 commented Woodlands' coach Nenad Bacina (above) when he addressed the press. "We were slow to open up the game but we scored at the right time and from set-pieces. "We were confident of getting all three points but It was a fair result in the end and I'm satisfy with one point." said the Croatian coach. 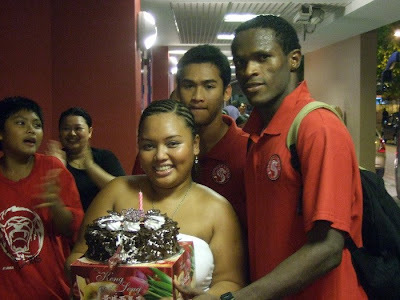 "Obadin (Aikhena, above extreme right with Rahim As'ari - second from right, celebrated their birthday after the match) has been a great influence to the team." said coach Terry on his assessment on his skipper who made his return to the squad after suspension ruled him out on the Monday's game. "He lead by example and shown he has a great character and a fighter on the field which earned him a great deal of respects from his fellow players, officials and fans" said the Young Lions' coach.